If you were elected president after decades of politicians doing nothing about the millions of illegals pouring into our country every year, committing crimes, dealing drugs, driving drunk, molesting children and killing Americans like Kate Steinle, and your central campaign promise -- repeated every day -- was to build a wall, wouldn't you have spent the entirety of your transition period working on getting it done? Maybe I'm a literalist. A zealot. When people kept telling me to be patient -- the wall is coming! -- I nursed a private hope that I was wrong, and they were right. Last week -- several whole days ago -- Trump said over and over again that he would shut down the government if he didn't get funding for the wall -- the precise thing he claims he needs. "We need border security. 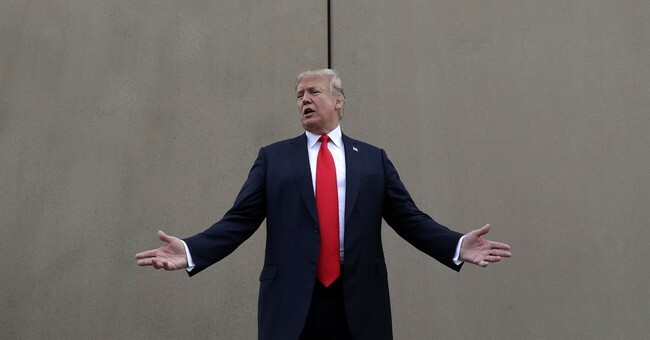 The wall is a part of border security," he said. "If we don't have border security, we'll shut down the government." Trump wore the shutdown over the wall as a badge of honor: "You want to know something? OK, you want to put that on me. I'll take it. You know what I'll say? Yes, if we don't get what we want ... I will shut down the government. Absolutely." Instead of joining a fight that will make his most ardent supporters cringe no matter how it comes out, why not choose a battleground where he's guaranteed a win? If Trump used the military to build the wall -- actually build it, not keep telling us he's going to build it -- the Democrats will go mad.